If you take care of it, it will last and if you clean it regularly, it will last longer. Salespeople at one store often suggest a formula suitable for scrubbing many outdoor fabrics. Metal chairs can be touched up with clear, rustproof paint. Scrub with a soft brush, leave on for a few minutes, and then hose off thoroughly. 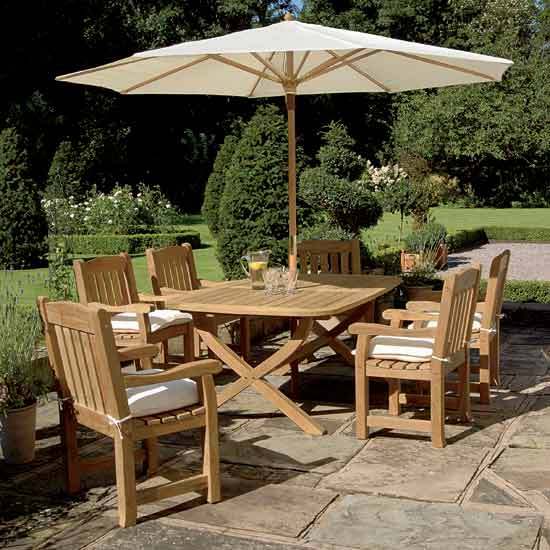 Many makers of teak and other wooden outdoor patio furniture suggest leaving it untreated to weather naturally and remain maintenance-free. Make sure an outdoor umbrella is anchored in a heavy base. Don’t ever leave an open umbrella unattended, a high wind can turn it into a flying sword. Plastic. Chairs and tables made of molded plastic or polyvinyl chloride are almost impervious to weather. Wash with detergent or use a creamy car polish to clean them. Cushions may water-stain and fade, so keep them protected when not in use. Aluminum. Restore the satiny finish of old aluminum furniture by polishing it with steel wool dipped in kerosene. Apply a rust dissolvent and let it stand for a few minutes to remove white blotches. Brush with clear lacquer or automobile paste wax to protect the restored finish. Spray stiff and creaky joints with a silicone lubricant. Replace rusty screws with corrosion-resistant ones. If webbing is torn or fraying, you’ll find webbing-replacement kits at hardware outlets. Wicker. You can wash it with a soft-bristled brush dipped in soapy water (a toothbrush works well in corners and tight spaces) although you should avoid drenching wicker. Let the furniture air-dry. You can change the look of new wicker with aerosol paint. 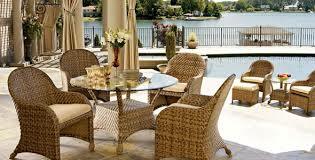 Experts suggest that you don’t need to paint it because old wicker often is valuable. Wrought Iron. This furniture is susceptible to rust but, fortunately, you have a wide choice of rust protectors. Apply one that leaves a polymer coating then paint the furniture with an acrylic or oil based paint. Automobile paste wax provides extra protection. Before painting, remove rust with a wire brush and coarse steel wool. Fix loose or broken joints with epoxy cement. The stylish lines and solid appearance of wrought iron is a natural for patio dining, and these pieces endure for decades. Cleaning and sealing any outdoor wood is not much different from doing the same thing for a wood deck. Outdoor wood tables, chairs, fencing, wood play sets, arbors and so forth all take the same abuse from Mother Nature. It will eventually rot and crack to pieces if you fail to maintain outdoor wood. Chemically treated lumber is able to resist rot for decades. Some wood, including redwood, cedar and teak, contain varying degrees of natural wood preservatives. But water that soaks into all these wood species will cause them to crack. The cracks start out as tiny checking cracks. Water entering the wood causes it to expand. As it dries, it contracts. This movement creates the tiny cracks. It soak deeper into the wood if water gets into the cracks causing even greater expansion and contraction forces that cause the cracks to get deeper and wider. That is why it’s important to treat all wood with a water repellent on a regular basis to prevent water from getting into the wood. Do this every year or so and your outdoor furniture and play set will look fantastic instead of resembling a 50-year-old fishing pier. I prefer to clean outdoor wood with oxygen bleach. However, do not use oxygen bleach on redwood, as it can darken this wood species. Use oxalic acid to clean redwood. It absolutely will damage the wood if use a pressure washer to clean outdoor wood. The high pressure stream of water erodes the softer, lighter colored band of spring wood that are found between the darker bands of summer wood grain. Do not use a pressure washer to clean outdoor wood. Allow the wood to dry after it’s clean. The washing process almost always raises the grain of the wood. This means you’ll have to sand it to get it back to that smooth furniture finish. Don’t skip this important step. A palm sander works great for this project. Use a medium aluminum oxide sandpaper. This paper self sharpens itself as it’s being used. You should seal it with a pigmented synthetic resin water repellent once the wood is sanded. Do not use an oil-based product. Most oil-based sealers are food for mildew and algae. The manufactures place mildewcides and algecides in the products to slow down the growth, but water and sun break down these chemical. The pigmented or colored sealers will keep the furniture looking spectacular. Clear sealers will gray rapidly. Some sealers require you to apply two coats within 15 minutes of each other to get maximum protection. Working in direct sunlight can shorten this time dramatically, leading to ugly spotting and overlaps. It’s urged you to work in the shade when applying the sealers. Working in the shade is easier on you, the wood and the sealer. If you can move the furniture inside your garage or other covered work area, do so. Sealing and staining outdoor furniture is quite different than sealing a deck. It requires a fine touch so your brush strokes are not seen and you don’t create any overlap marks. You have to maintain a wet edge with the sealer, which means that you stain each piece of wood completely so you don’t stop working until you reach the end of that piece of wood or it intersects with another piece of wood. Failure to do this can result in very unattractive overlaps where the color of the sealer seems darker at the overlap area. It can be as simple as giving pieces a good cleaning and applying a fresh coat of paint. You can make worn outdoor furniture look as good as new. 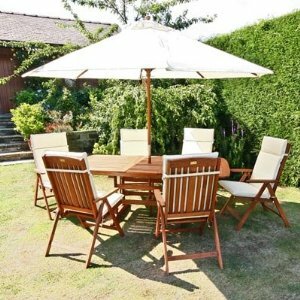 Don’t despair if your outdoor furniture is beginning to look a little ragged. With a little elbow grease and some paint, you’ll be sitting pretty in no time. For rescuing outdoor furniture, check first for major flaws. If you do not have the ability to fix broken slats, ripped and wobbly legs, then recycle the piece for someone else to repair. However, chipped paint and rust is not difficult to conquer. Wicker is making it an ideal choice for the garden, balcony or deck because it is resistant to wet weather and is comfortable. Clean the wicker with a mild detergent and damp cloth and wipe dry. Gently brush or sand away loose paint flakes. Spray the piece with a coat of white acrylic primer and let dry. Using exterior latex paint, apply your choice of color. When spraying, use a gentle sweeping motion and work from different directions to reach all sides of the wicker. For solid coverage, apply two thin coats to avoid drips. If you want the new wicker chair shown here to have an antique appearance, you can distress the wicker by rubbing red paint in random patches into the wicker with a bristle paintbrush after the prime coat. Followed by patches of pale green, making sure all the wicker was covered with one of the paint colors. Layering different shades gives the look of years of wear and fading. Wood furniture is an ageless favorite, from Adirondack chairs and cedar benches to pine or barn-board picnic table. Refresh painted wood by cleaning wit soapy water, but don’t saturate the wood. Sand to remove paint flakes, and rough up the surface if the old paint has a glossy finish. Then prime and paint. Choose exterior latex paint with a gloss sheen for a durable finish. If wood has been stained, clean, then sand to open the wood’s pores. You have a choice of colored stains as well as the traditional wood tones. Try a combination of purple, blue, red or yellow stain shades to liven up a deck or family seating area. Regarding teak wood, it requires very little care or maintenance to last decades because it has special qualities that make it ideal for outdoor use. There are some recommended products that you can use to treat the wood in order for it to keep a beautiful color long after you buy it. But if you apply the wrong type of product, it can actually be harmful to teak wood in the long run. Most teak furniture manufacturers recommended not using teak oil. The wood’s natural oil is sufficient to protect it from damage. Teak oil is not actually the same as the natural oil found in the teak tree. It is just called “teak oil” for marketing purposes, when really it is mostly composed of linseed oil and solvents. When freshly applied, teak oil will give the wood a nice attractive glow, but this will be short-lived. Before long, the teak oil on the surface will dry out and your furniture will quickly fade in color again. You will have to keep reapplying oil every few months to keep ahead of the graying process. « Are You Looking For The Best Indonesian Teak Furniture?